Subscribe to the 'Hamster update now! Montgomery(JM) Standing on the steps of the Capital, near the spot where Jefferson Davis was sworn in as president of the Confederacy, Alabama governor Donald Siegelman today unveiled the design of the state's commemorative quarter-dollar coin. 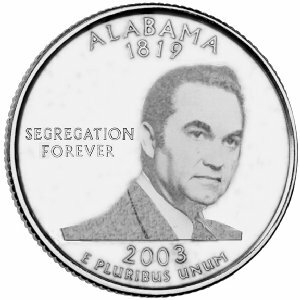 The Alabama quarter, to be issued in late 2003 as part of the U.S. Mint's '50 States' program, features a likeness of long-time governor George Corley Wallace above the famous phrase "...segregation forever" which he spoke while physically barring two African-American students from enrolling at the University of Alabama. In selecting Wallace for the honor of appearing on Alabama's quarter, Siegelman reflected on the populism of his more renowned predecessor. More than 300 designs were submitted to his office during the year-long contest. Schoolchildren from around the state sent in drawings of camellias, yellowhammers, cotton, striped bass, the U.S.S. Alabama battleship, the Vulcan statue, and most popular - rocket ships depicting Huntsville's contribution to the space program. Children don't vote, however and Siegelman's office selected themes that reflected the concerns of the majority of the electorate. Of the five designs sent to the U.S. Mint, Wallace featured prominently in two while the others depicted NASCAR racing, Bear Bryant and Shug Jordan, and the Mercedes three-pointed star. Because none of the submissions from Alabama classrooms made the final cut, the $10,000.00 prize money will remain in the governor's discretionary fund, possibly helping to pay for the ongoing restoration of the Confederate Veterans Memorial on the capital grounds. Malfunction Junction(JM) Work to reconnect two sections of I-65 South destroyed in a fatal tanker accident earlier this month has begun in earnest. Conjunction crews with expertise in junction work are now on the scene and are directing the difficult work of reconnecting jumbled fragments with new, stronger conjunctions. Even before the recent incident, malfunction junction had earned a reputation as a difficult passage. It is hoped that by including stronger conjunctions, as part of an overall master plan to overhaul and clarify the junction's functions, that navigation through the area will be simpler as well as safer. 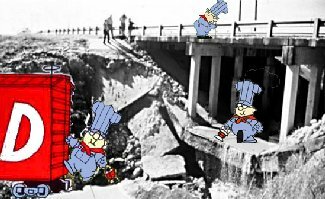 Despite such lofty plans, the pressing need is to rebuild the one damaged bridge at the junction, restoring a base level of malfunctioning until further work can be done. The conjunction crews already in place have an injunction to complete this phase within a strict 90-day time frame. Montgomery() A solution to Alabama's education funding woes was found Tuesday during a routine cleaning of the governor's mansion. In a leather sofa next to the wet bar, the cleaning crew discovered $160 million in loose change. The money was found by Charles Rodriguez, a part-time employee with no benefits. "I heard Charles exclaim loudly, and ran over from where I was straightening the humidor," said mansion Chief of Staff Jane Mimsy. "I was so stunned by what I saw that I almost dropped the crystal decanter." Governor Don Siegelman immediately held a press conference to announce that the education shortfall had been eliminated. "So many people come through here every year, it is impossible to tell whose money this is," said Siegelman. "We will just have to keep it and use it for education." 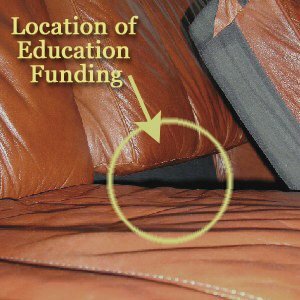 The governor has not decided whether or not to use the sofa as a permanent source of funding. "We will get together with the various state business leaders to determine if the couch repository is the most equitable solution," said Siegelman. "If they want to continue funding this way, we will continue to have poker parties at the mansion."